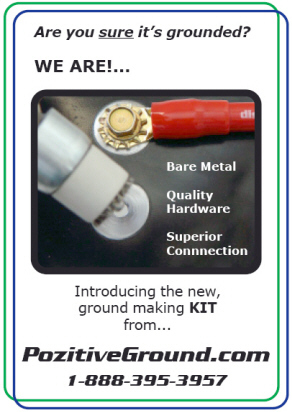 Pozitive Ground has developed a unique grounding system that creates the ultimate ground-bonding in a simple four step process. fly through the hole and do damage. BRUSH Use the custom drill brush to clean ALL the way down to bare metal. GEL Clear gel is formulated to promote conduction by inhibiting corrosion. Drive Use the supplied magnetic driver to tap and fasten with the special anodized tapping bolts.